Browse through the wide selection of wholesale metal armour offered here at LARP Distribution to see the many excellent individual pieces and wholesale armour packages that we have available. 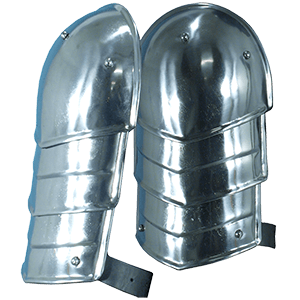 We offer steel bracers, steel gauntlets, steel pauldrons, steel greaves, steel gorgets, steel helmets, steel breastplates, and more, made primarily from 18 gauge steel. In addition to our wholesale steel armour, we also offer helmet stands and armour stands for displaying pieces when they are not in use. 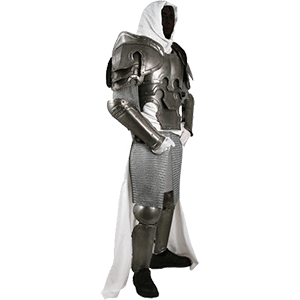 The wholesale steel LARP armour that we offer makes an excellent alternative or complement to our wholesale leather armour. The wholesale steel arm armour that we offer at LARP Distribution comes in a variety of different sizes and styles that look great with other pieces of our wholesale metal armour. We carry high-quality wholesale steel bracers that fit around the arms with straps and buckles. Several of our pieces display unique patinas that give the LARP armour a darkened, greenish, or aged appearance. 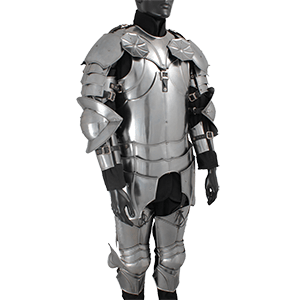 Our metal arm armour suits medieval knights and many other historical or fantasy warriors. Perfect for medieval knights and other historical warriors, our wholesale steel plate armour at LARP Distribution includes excellent pieces made from 18 gauge steel. We carry several designs of wholesale steel breastplates in multiple sizes that can be worn on their own or connected to one of our matching wholesale steel backplates for increased protection. Several of our medieval breastplates display darkened finishes while others gleam with a polished appearance, ensuring that LARPers can choose the look that works best for their characters. 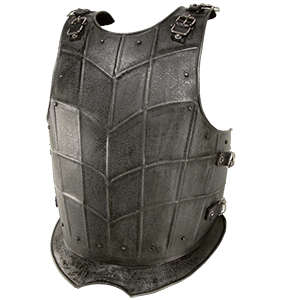 The wholesale steel backplates at LARP Distribution combine well with our wholesale steel breastplates, creating an impressive layer of protection around the entire torso area. We carry excellent LARP backplates crafted from 18 gauge steel that are perfect for medieval knights and other warriors and are made available in several different sizes to suit most customers. Many of these medieval backplates feature shaped shoulder blades that create an impressive appearance, and several pieces display patinas or finishes that give them a striking look. 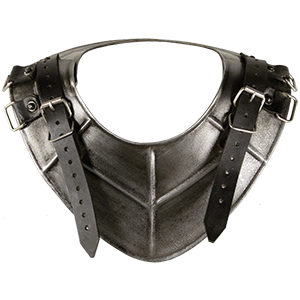 Here at LARP Distribution, we carry a selection of excellent wholesale cuirasses and wholesale harnesses made primarily from high-quality 18 gauge steel. This wholesale body armour comes in several sizes and styles, including striking pieces designed for characters like Roman legionnaires and medieval knights, as well as several others with unique patinas. We recommend pairing this wholesale LARP armour with our wholesale gambesons and other padding to ensure a safe and comfortable fit. 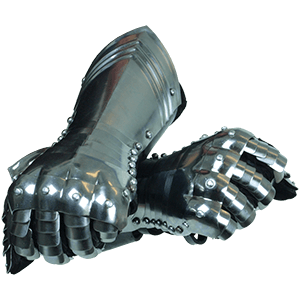 Offering protection to the hands of LARP warriors, the wholesale steel gauntlets available at LARP Distribution feature excellent construction from high-quality leather and 18 gauge steel. The articulated joints in our functional wholesale gauntlets ensure ease of movement and comfort while in battle. We carry wholesale LARP gauntlets in several designs so we can accommodate popular looks ranging from medieval knight to fantasy warrior, as well as styles that match our other ConQuest armour. Adding authenticity to medieval, Renaissance, or fantasy armour, the wholesale steel gorgets and wholesale steel neck plates available from LARP Distribution come in a variety of styles that match with other pieces of our wholesale steel armour. We carry high-quality pieces suited for children and adults that display darkened metal, polished finishes, or texturing so each item has individuality. Made primarily from 18 gauge steel, many of our LARP gorgets and medieval neck plates have straps on each side as well as rings for connecting to our wholesale steel pauldrons. 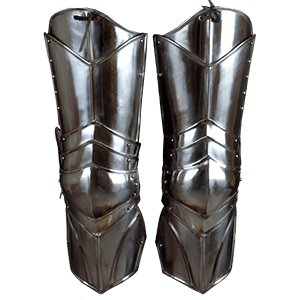 Offering protection to the shins, knees, and calves, our wholesale steel leg armour at LARP Distribution comes in a range of styles suitable for medieval knights, fantasy LARP fighters, and other historical warriors. We carry a fine selection of wholesale steel greaves and other steel leg protection made mainly from 18 gauge steel. Many of these pieces display darkened metal or colored patinas that set each item apart. 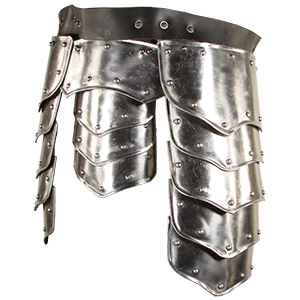 The designs of this wholesale leg armour go well with our other wholesale steel armour. Our functional wholesale steel helmets at LARP Distribution make an excellent choice for LARP events or unique display pieces. 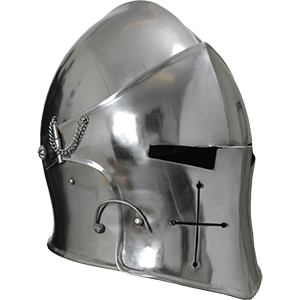 We carry wholesale replica LARP helmets and steel helms in a variety of historical styles, including barbuta helmets, sugar loaf helmets, nasal helms, crusader helmets, Viking spangenhelms, and more. These steel helmets come with polished or darkened metal finishes, ensuring that a wide range of looks is available to go with our other pieces of wholesale steel armour. Compatible with many of our wholesale gorgets, the wholesale steel pauldrons offered by LARP Distribution display styles that mesh well with our other pieces of steel LARP armour. 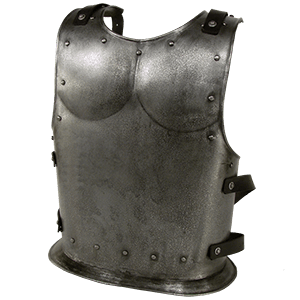 We carry wholesale shoulder armour primarily made from 18 gauge steel, including several with sword breakers crafted into the design. Our steel pauldrons suit medieval knights, fantasy warriors, mercenaries, and other popular LARP characters, many of the pieces displaying polished or darkened metal finishes or texturing to give them a unique look. Ideal for guarding the legs and groin, the wholesale tassets and wholesale leg armour provided by LARP Distribution come in a wide range of styles that match and are compatible with the other steel LARP armour that we offer. 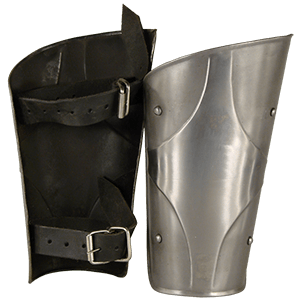 We carry many pieces of medieval leg protection like belted tassets made from high-quality 18 gauge steel, including pieces with polished or darkened metal finishes. Our wholesale steel tassets suit a variety of popular LARP characters, such as medieval knights, mercenaries, and fantasy warriors. The wholesale complete armour packages that we offer here at LARP Distribution contain many excellent pieces of our wholesale steel armour, making them perfect for outfitting medieval knights, mercenaries, and other LARP warriors who want an impressive appearance. We carry an assortment of steel armour sets made primarily from 18 gauge steel in several size options. Many of our medieval armour packages feature a polished shine, though several display darkened metal or texturing for an alternate look. 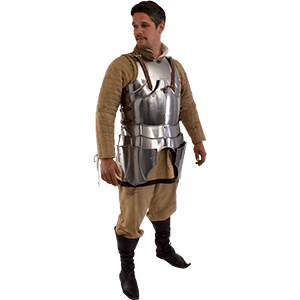 Our wholesale gambesons and other armour padding make excellent additions to these armour sets, ensuring that they fit without rubbing or pinching. Occurring annually in Europe as one of the largest LARP events in the world, ConQuest develops intricate worldbuilding that makes use of certain Forsaken elements, such as Black Ice and Undead Flesh. These two elements inspire the look of our wholesale ConQuest armour, which includes individual pieces of LARP armour and steel armour packages with armour accessories like tabards and belts. Our wholesale fantasy armour displays a unique look that will stand out from our other medieval armour pieces, though it can be mixed and matched easily with other styles.